3 months in the top ten bestseller list! When I was asked to foster a new born baby I was worried if I would remember how to look after a baby. I hadn’t fostered a baby before and Paula my youngest child was aged five, so it was some years since I’d made up feeds and changed nappies. Jill, my support social worker, reassured me I would be fine, and I was asked to go to the hospital to collect baby Harrison when he was only one day old. He was gorgeous, but I began to realize just how unusual this case was going to be. There was no background information on Harrison and his social worker told me that Harrison’s existence was known only to a few, and if his whereabouts became known his life and that of his parents could be in danger. I was concerned and intrigued. However, when a woman I didn’t know began appearing in the street outside my house acting suspiciously I became worried for my own family’s safety. I demanded some answers from Harrison’s social worker and what she told me was both sad and shocking and would affect Harrison’s life forever. …have never been more drawn into a book as I was while reading A Baby’s Cry…. I would recommend this book to anyone. 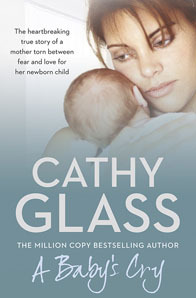 I have just finished reading A Baby’s Cry, which was an emotional and moving read. I have read all Cathy’s books at least three times, and every time they reduce me to tears….an amazing individual. A Baby’s Cry kept me on the edge of my seat…couldn’t put it down. The whole mystery of Harrison’s mother and her secret was totally gripping. Brilliant. Another good read from Cathy glass. A real page turner as usual.